It's been nearly eight years since a Bai Bang full-length studio album, probably way too long to wait for these talented Swedes. 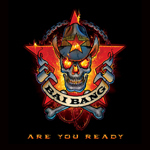 With 'Are You Ready,' Bai Bang returns to their fine form of delivering melodic hard rock with some glam/sleaze overtones. Two things are clearly evident on this 10 song disc. First, the production is nearly immaculate: Bai Bang has not sounded this tight and polished on any previous recording, and the mix gives the whole album a thick arena rock sound. Second, with few exceptions, great emphasis and care was given to the vocal arrangements: they are bright and sweeping as on the opener 'I Love The Things You Hate' and the massive power ballad, 'Only The Best Die Young.' Along with the heavy-riffed and melodic 'Longtime Cumin,' these are the finest tracks on the album. But, even with this praise, I do have some caveats along the way. As much as attention was given to production and vocal arrangements, I wish Bai Bang would have done the same for song composition and guitar solos. In this case, these two go hand in hand: where their are little or no guitar solos, I found songs like 'Born To Rock,' 'We Come Alive,' and 'Bigtime Party' incomplete and lacking the vigor that their titles imply. This is especially evident on the last song, 'Bigtime Party,' which hardly inspired a rowdy party time in my listening ears. It's good to have new material from Swedish rockers Bai Bang. However, though production and vocal arrangements are strong, 'Are You Ready' is an uneven offering melodic hard rock wavers between thrilling and ordinary. It's good to have new material from Swedish rockers Bai Bang. However, though production and vocal arrangements are strong, 'Are You Ready' is an uneven offering melodic hard rock that wavers between thrilling and ordinary.